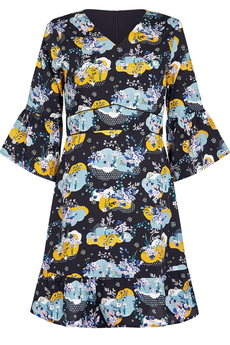 Cloud Pattern Tea Dress is a lovely transeasonal dress beautifully made with soft fluid fabric. Adorned with Japanese floral scene print, with a fitted empire waist with black piping and flared skirt with a ruffle hemline. The flared sleeves add a retro charm to this pretty dress. Has concealed back zip fastening, it is fully lined and is approx. 92cm in length. Winter collection. Composition: 100% Polyester. Color: Black.